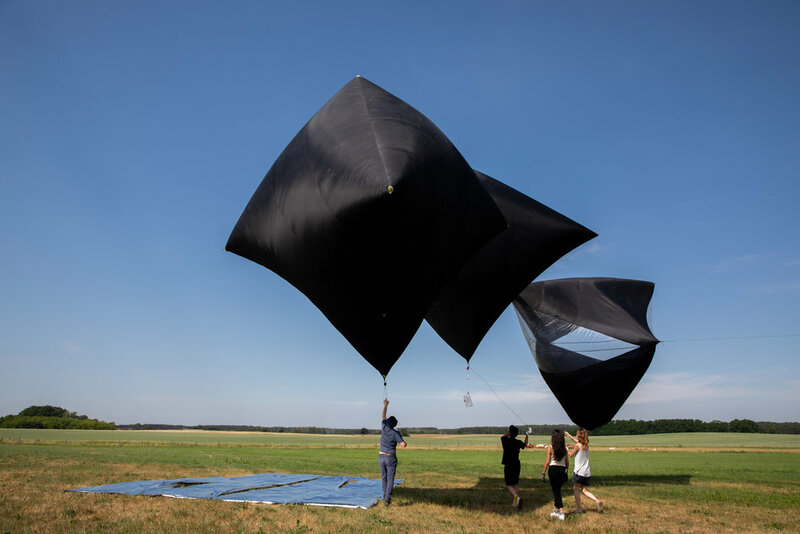 Last Saturday, 9th of June 2018, two Aerocene sculptures were released in a free flight and later kindly tracked, found and retrieved by Polish radio-amateurs from Radiosondy Polska. At 9 am, over 40 Aerocene community members joined together to celebrate the launch of the book ‘Aerocene’. This was no regular book launch, since as a symbol of the continuous, soaring journey of Aerocene, a copy was attached to the sculpture Cyanophyta to be carried by easterly winds and delivering our message to the world, filled only with air, lifted only by the sun, carried only by the wind. Throughout the pleasantly sunny morning, the Aerocene community guided Aerocene explorers through the air, which are tethered flight starter kits enclosed in a portable back-pack, created to introduce you to atmospheric expeditions in a way that allows you to sense the environment encircling you in a new fashion. Observing the sculptures ascending and descending, fluctuating as guided by the wind, induced an entirely original aura of tranquility over many of us. Sincerely, witnessing and observing the soft and yielding material of Aerocene sculptures symbolizes nothing short of a magnificent conjunction of technology, art and sustainability, an interest many of the community members share with eachother. This was expressed in a beautiful way as community members such as architectural enthusiast Matthias Böttger took initiative to interact with the explorers. Everyone guided and observed the explorers as they decorated our surroundings with aerial signatures, marking our collective agreement to open the Air of Commons Convention - the Aerosolar Transnational Agreement declaring our matter of concern: de-carbonization of the air! As a newly joined Aerocene community member, this was an experience I would surely never forget! In the midst of these explorers, Cyanophyta was released, carrying a copy of the newly released ‘Aerocene’ and accompanied by another ascending sculpture, which rose together and were swept away, purely rising by the energy of the sun and travelling by the power of the wind. Cyanophyta´s nomenclature originates from organisms that initially changed the composition of Earth´s life forms by producing and releasing oxygen, and now it was time for our soaring sculpture to challenge their legacy by strengthening our agreement of decarbonizing the air. Crossing borders into the new epoch Aerocene, Cyanophyta carried our collective signature of our commitment to a sustainable future for all. The sculptures were released around 10 am and floated in ensemble as we observed the way they intertwined with surprise and delight. Just as the two sculptures soared together, bound in a similar path through the force of the wind, we remained together, bound by the message being delivered by Cyanophyta: free from borders, free from fossil fuels. After the release of the sculptures, there was an interesting communal attentiveness to the location of the sculptures in the sky before they surpassed our field of view. During this time, people began to find increasingly creative ways to describe the position of the sculptures in the air to one another. Creativity and collaboration is an important aspect of Aerocene which is also shared with members of the community such as Thomas Heidtmann, a media artist from SPARTH. As interesting and inspiring individuals, all members of the community mingled, enthusiastic about the developments being made for the journey of Aerocene, as we kept an eye on the sculptures slowly disappearing behind effervescent clouds. Along with the amazing engagement of the people present at the launch, we were gifted the efforts of new friends of Aerocene across the border in Poland. Some amazing people who took the task upon themselves to track, find and retrieve the sculptures upon landing. As community members celebrated, chatted and enjoyed each other’s company in the fields outside of Berlin, watching the sculptures take flight and disappear beyond the horizon, efforts were already being made to find the sculptures over in Poland. Only hours after the launch, messages began to arrive about the search from people that were excited to join the effort. The first sculpture was found on the same day, while the one carrying the book was searched for over the weekend and found on Monday the following week. The amount of time and energy invested into the recovery by the community members across the border and their enthusiasm to do so is an extraordinary sign of the growing network of the community. So whether squinting to try to find the sculptures above, looking on a screen to track the sculptures via satellite, chasing the sculptures, or all of the above, our amazing Aerocene community made the launch as spectacular and uplifting as one could have hoped. And as a growing community of people, by exploring buoyancy using the natural resources that continuously dance around us, - the sun, the air, and the wind - we collectively join their dance in a venture to grow more attune to the natural rhythm of the planet.